Dave's Computer Tips: WinPatrol – the ideal software to augment your security? Security strategies have long been a hot chestnut for discussion, opinions are as varied as the software itself and myths abound. Achieving maximum security is theoretically as easy as merely installing lots and lots of lovely security software – but in reality, elements such as conflicts, excessive resource usage and massive slowdowns make that approach impracticable, if not impossible. So ‘maximum’ security is pretty much a misnomer, what we are actually seeking is ‘optimal’ security – the best possible balance of software to system resources. So, what is the best way to augment our traditional anti-virus software and enhance security? Sorry to say, because there are so many varying configurations involved and surfing habits differ from individual to individual, there is no such thing as a universal solution. What’s best for one may not work well for someone else. However, there is one program which comes very close to a ‘one size fits all’ solution, that program is WinPatrol. 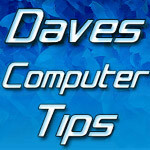 Dave's Computer Tips daves computer tips, winpatrol. permalink.